The most difficult thing for me in the Thai language are the months. I can carry on a decent conversation in Thai, but ask me what the month of May is in Thai and I’ll be stuck. Unlike most European languages, the names for the months in Thai do not resemble English month names at all. That means there are fewer associations to help you remember the names. Perhaps I never learned the months in Thai because I could always fall back on a nearby calender or I’d simply use the number to refer to each month. For example, month number 7 is July or “ga-ra-ga dar kom” and month number 10 is October or “dtoo lar kom.” After all these years, I’m starting to remember the names of a few months. I do know that the ending on the name of each month tells you how many days are in the month. Months ending with “yon” have 30 days while months ending with “kom” have 31 days. February, of course, is unique and ends with “pun” with 28 or 29 days. Today I had the opportunity to go behind the scenes at a Chinese restaurant in Bangkok to see how they prepare Peking duck. 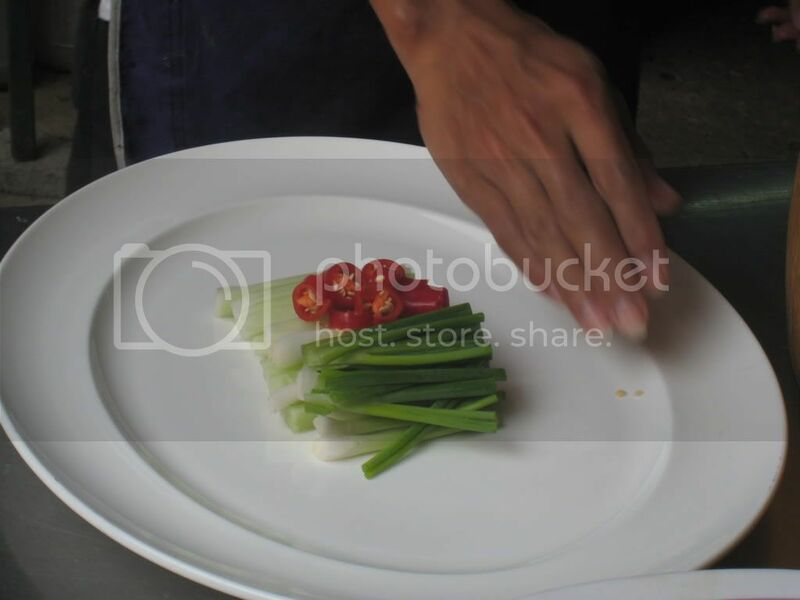 This dish is considered to be a delicacy and requires special techniques to make. It comes from the province of Peking in China and is enjoyed all around the world. First, you start with a special type of duck that is around 2.7 kilograms. These ducks have a desired size and quality that meet the restaurant’s standards. Next, the duck is plucked and cleaned if it has not been already. The duck is then coated with 1 tablespoon of seasoning inside the body cavity. Then, thhe duck is sealed by sewing up the opening with a metal hook. The next step involves an air compressor. Interestingly, a hose is placed into the duck through the neck area and while the sewn part is covered with a cloth to prevent air from escaping, air is pumped into the duck. 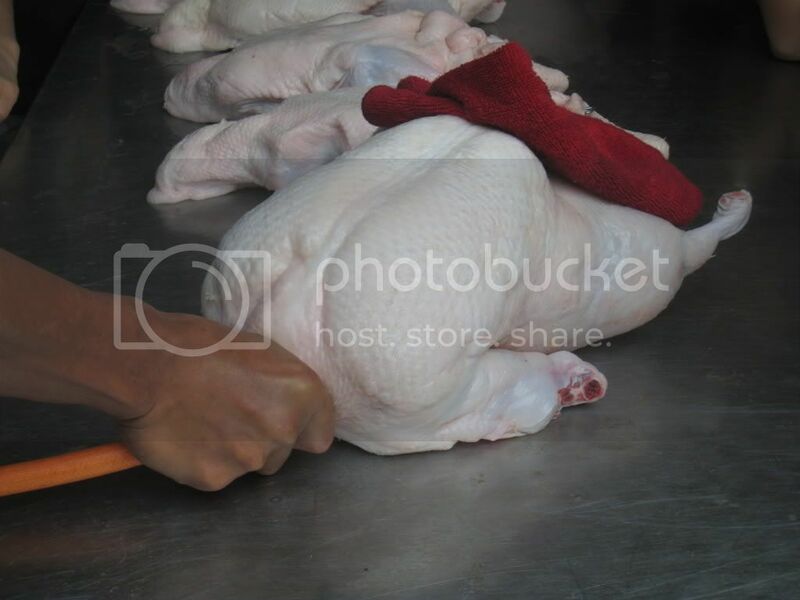 This allows the skin of the duck to seperate from the meat more easily and ensures that the skin is not overlapping. After this process, the duck is hung in a fridgerator for 24 hours. 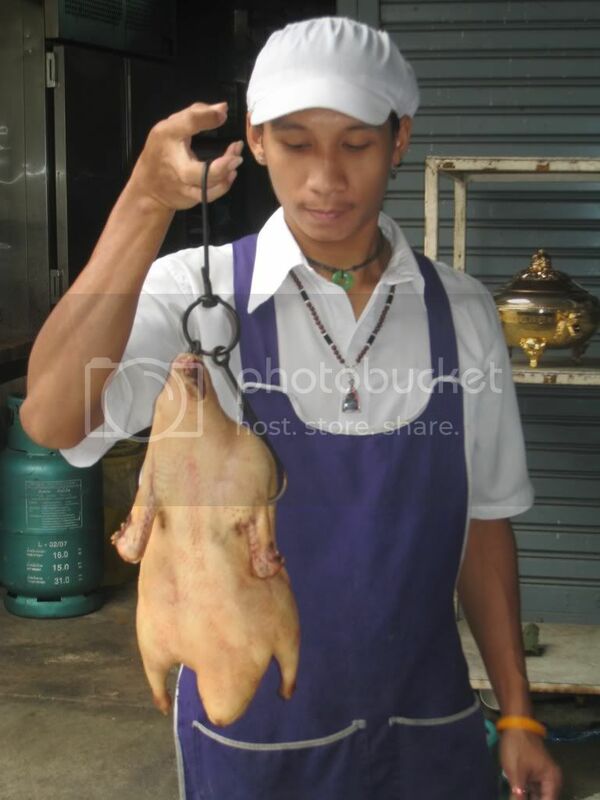 When it is time to cook the duck, the duck is removed from the fridge and the hooks are removed. Then the duck is placed in an oven that is called a “capusle oven” for around 20 minutes. 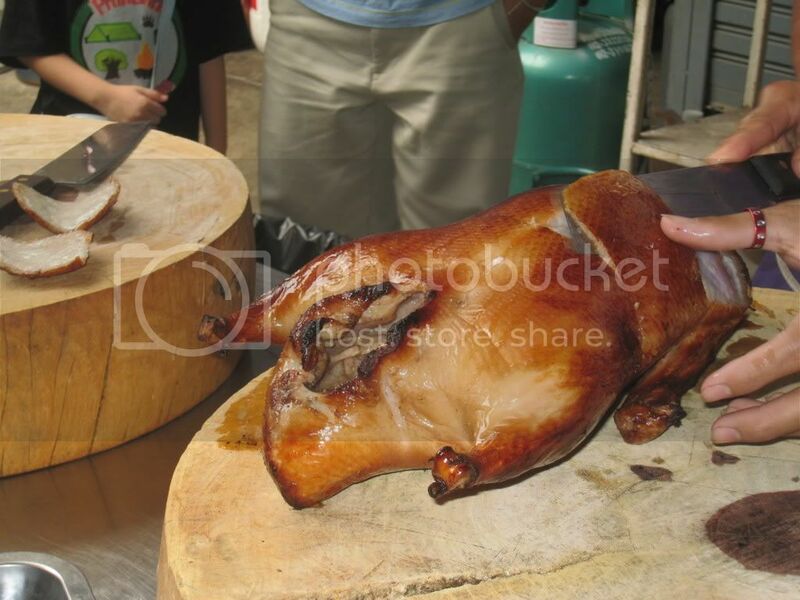 When the duck is removed, the skin is the dark reddish-brown typical of Peking duck and is ready to be sliced off and served. One duck yields approximately 15 pieces of skin. The duck meat can be made into other dishes such as duck soup and minced duck. 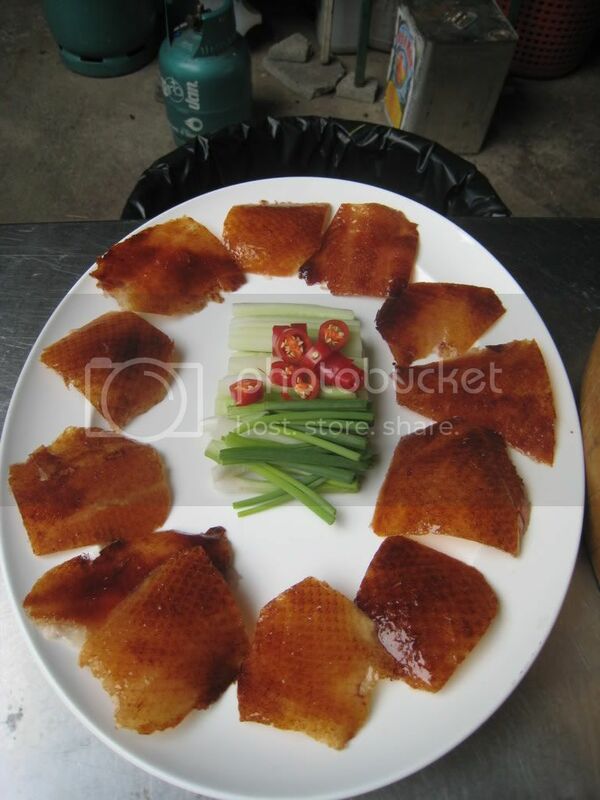 The crispy pieces of duck skin is placed on a flour paper. Next a sweet soy sauce is spread over the duck skin and add a few pieces of cucumber, green onion and chili for crunchiness and taste. Since there are only a dozen or so pieces, you’ll be limited to one or two slices of duck skin each. What’s So Good About Thai Food? Thai food is one of those popular ethnic foods that you can probably find in most major cities. Thai cuisine is famous for it spiciness and unique combination of flavors. A lot of care is taken to make sure that each bite has the desired taste. There is such a variety of Thai dishes and it is hard to characterize what Thai food is. Thai food usually includes locally found ingredients from plants and herbs to chicken and fish. Most meat is added to dishes in small pieces. Larger cuts of meat are shredded and infused with herbs and spices. Traditional Thai cooking methods are stewing, baking or grilling. Frying, stir-frying and deep-frying techniques are a result of Chinese influences on Thai cuisine. 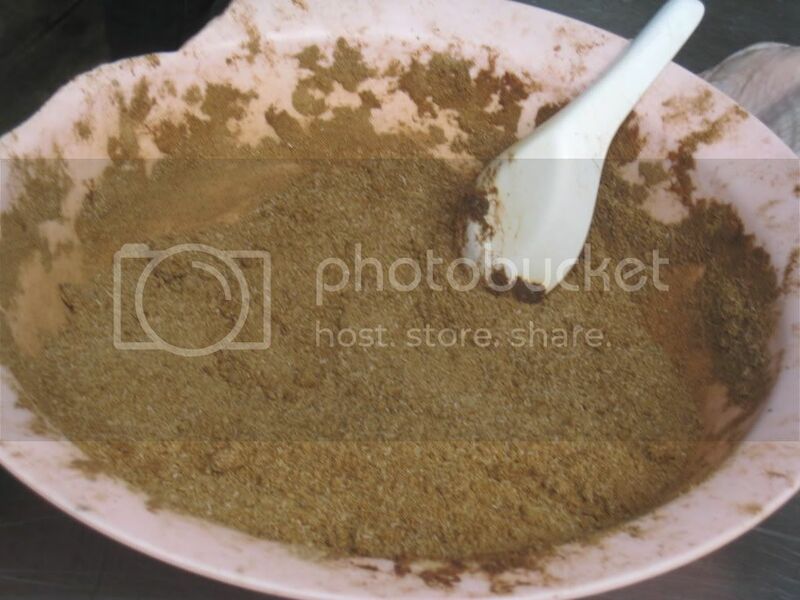 Thai curries are a modification of Indian curries and is another example of the Thai way of adapting foreign food by mimicking cooking methods and substituting ingredients. A proper Thai meal will have several dishes and a bowl of rice. Usually there will be a soup, a curry or spiced salad, vegetable dish, and a meat or fish dish. The spicy dishes are intermixed with milder dishes such as a spicy soup and stir-fried vegetables. Often, pieces of several dishes are placed on the same spoon with a small amount of rice so that each bite is a harmony of tastes and textures. Numbers are important for bargaining in Thailand. If you are serious about shopping and are looking to get good deals on the items you buy, you will have an easier time dealing with the vendors in outdoor markets like Chatuchak in Bangkok and the night bazaar in Chiang Mai. However, if your Thai language skills fail, simply punch in your bottom line onto the vendor’s calculator or write it down on a piece of paper. Learning the first ten numbers and the correct pronunciation of the words is the most difficult. After that, it is a matter of adding the different parts of the number in order to make larger numbers. For example, if you look at the numbers 30-90 in the list above, you simply add “sib” to the name of the number in the tens place to describe these words. Only 10 and 20 are exceptions to this because you only have to say “sip” for 10 instead of “neung sip” and 20 follows no rule at all. The principle of combing the names for the different parts of the number still apply with larger numbers. In the hundreds place and up, you always say the number in the largest place followed by the unit of that number. So, 100 is neung roi, 200 is song roi, 300 is saam roi and so forth. Similarily, 1,000 is neung pan, 4,000 is see pan, 20,000 is song meun, 70,000 is jed meun and so on. If the number is something like 1,253 then you have to add each part of the number from largest to smallest place value and it would be neung pan-song roi-har sib-saam. Thailand has an interesting way of encouraging the public to vote. The government likes to celebrate every major election by banning all sale of alcohol for nights before and during the election period. This also includes the election days for people who are registered to vote in another province and elect to vote during the preliminary voting period instead of going to their home provinces to vote during the main election period. During the weekend of different elections, pubs and bars all over Thailand close completely or are limited to food and drinks that are non-alcoholic. Needless to say, election weekends can be a major pain in your side if you needed to get out that particular weekend. For the the preliminary voting period, most workers are still in the city and only the late night activities are limited. For the main election period, Bangkok virtually empties as the workers flock to their home provinces to cast their votes. Often the government will declare the following Monday a work holiday for the main election period so that the workers will have enough time to travel back from their homes without having to worry about their employers docking them for missing work. Other than allowing the voting public to go home to vote instead of working non-stop in the hospitality industry in major cities, the ban on alcohol also serves to ensure that the voters are not hung over on the day that they make their decision and cast their votes for their desired candidates. Restaurants, mini-marts and supermarkts also enforce the ban on alcohol sales and it can be difficult to buy alcohol during the election period from the Friday before the election onwards. It is unknown how much the ban on alcohol actually increases voter turn out at the polls. A late night of drinking can make a person rather lethargic the next day and even if you are not hung over, you may be less likely to do your civic duty if you are tired from the previous night. At the very least the average working man is more likely to be sober when he shows up to vote because he can’t afford to stock up on his beers before hand. For those of us who can buy our alcohol ahead of time, we’ll just have to settle for a relaxing evening at home drinking a few beers instead of the normal lively club scene until 2 o’clock in the morning. I was filling up with some 91 gasohol near Kasetsart-Nawamin Road and I noticed that the station had a pump of E20 as well. There was a large orange sign to promote the new E20 gasohol. Unfortunately, my car cannot handle the 20% ethanol in the E20 gasohol mixture. It seems that the phase out of benzene is continuing as planned. As it is, benzene 95 are being replaced with 95 gasohol, but benzene 91 is still rather common compared to 91 gasohol. Since older cars are not able to use E20 gasohol, gas stations will need to offer benzene and E10 gasohol as alternatives for many years yet. Thailand is commonly known as the “Land of Smiles,” but the Buddhist nation is sometimes called the “Land of Yellow Robes.” Traditionally, Buddhist monks and novices in Thailand don yellow colored robes. They can be seen in the early hours of the morning. This is the time that they go out in the community surrounding their monasteries for alms. It is a daily reminder that Buddhism is a powerful force in the lives of Thai people, even in a day and age where most people do not have time in their busy schedules to make alms each dawn. Most Thais (approximately 95%) believe in a form of Buddhism called Theravada. This Theravada school of Buddhism prevails in Burm, Ceylon, Cambodia and Laos as well as Thailand.Buddhism has been combined with folk beliefs and ancestor worship, as well as aspects of Chinese religions that many Thai-Chinese still adhere to. The Buddhist architecture is similar to that of surrounding countries, especially Cambodia and Laos, because they share common cultural and historical heritage. Buddhism is a religious movement started in the sixth century B.C. by Prince Siddhartha Gutama Sakyamuni. Later, he became known as the prophet, Buddha. He encouraged his followers to follow the Middle Way and practice moderation in all aspects of living. Buddha taught that life was pain and suffering because we have cravings and desires. He saw that the only end to the suffering was when those cravings and desires ceased to exist. When the end of suffering was achieved, one had reached nirvana. This state of absence of craving and by extension suffering, is also known as enlightenment. In the next few centuries, Buddhism spread throughout Asia. Buddha’s teachings were interpreted differently by different groups and resulted in several sects including Theravada Buddhism. In Ceylon, present-day Sri Lanka, the teachings were put into written form in Pali (an Indo-Aryan language realted to Sanskrit). These teachings from the Theravada school of Buddhism were imported to Thailand around the sixth century A.D. and became the state religion during the Thai kingdom of Sukothai is the thirteenth century A.D.
Other forms of Buddhism reached Thailand at different periods in Thai history. Theravada Buddhism is thought to be the first. Next was the Mahayana school of Buddhism that spread from India to Sumatra, Java and Kambuja (Cambodia) starting in the fifth century A.D. This form of Buddhism is more evident in the south of Thailand and is believed to have been at its height when Thailand was part of the Suryavarman dynasty in Cambodia. For awhile, Theravada and Mahayana both existed in Thailand, but Theravada already had a large following and Mahayana never eclipsed it in popularity. In 1057 A.D., Burma’s borders extended into areas of modern-day Thailand, including Chiangmai, Lopburi and Nakon Pathom. At the time, Buddhism in India was declining and the Theravada Buddhism common in Burma at the time altered from its original form. This type of Buddhism became known as Burma Buddhism. The last form of Buddhism introduced to Thailand was called Ceylon (Lankavamsa) Buddhism. Around 1153 A.D. there was a powerful king of Ceylon that was a strong supporter of Theravada Buddhism. Buddhist monks from neighboring countries, like Burma, Kambuja, Lanna (Northern Thailand), Pegu (Lower Burma), and Lanchang (Laos) migrated to Ceylon in order to learn the form of Dhamma practiced there. Some Ceylonese monks returned with the local monks and settled in Nakon Sri Thammarat in the south of Thailand. Many kings from the Sukothai and Ayudhaya Period supported Ceylon Buddhism. Today, Thailand is called a Theravada Buddhist country, although there are a few Mahayan monks and monasteries that have a Chinese influence. The various forms of Buddhism in Thailand have never competed with each other and seemed to blend gracefully with each other, influencing the beliefs of different regions of Thailand to different degrees. Difference Between Gasohol 95 and Gasohol 91? Gasohol is a mixture of gasoline and ethanol, hence the name which is a mixture of the two words. It is an alternative fuel to 100% gasoline and helps to reduce the consumption of expensive and nonrenewable gasoline. Many countries use gasohol, such as Brazil, Canada and Thailand. Here in Thailand is has been on the market since 2001 and is being promoted to increase public use. There are even commercials on TV that speak of the good qualities of gasohol and reassures the public’s apprehensions about using gasohol. People are becoming more aware of gasohol and it’s usage has increased over the years, but many people still use regular gasoline over gasohol. There is a very aggressive long term plan by the Thai government to change all benzene, or regular gasoline, pumps into gasohol. 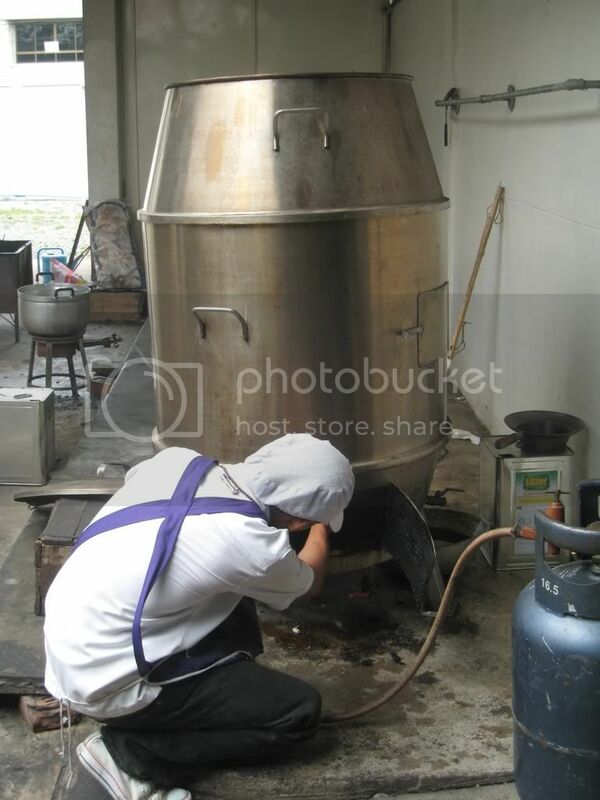 At this time, however, gasohol pumps are hard to find outside of Bangkok and major cities. Bangchak and PTT are more likely to carry gasohol than other gas stations, but in smaller cities it’s hard to find even one pump with gasohol. Also, Gasohol 95 is relatively more common than Gasohol 91. Gas stations may use different brand names to market the fuels, but generally they are coded in the same colors. Gasohol ranges from 2.5 bath to 0.70 satang cheaper than regular gasoline at the same octane. All of the gasohol on the market in Thailand today is E10, meaning that it is a mixture of 10% ethanol and 90% gasoline. The primary difference between gasohol 95 and gasohol 91 is that the 10% ethanol is mixed with 95 octane gasoline in the case of gasohol 95 and 91 octane gasoline in the case of gasohol 91. The mixture of gasoline and ethanol does have disadvantages such as loss of power and fuel efficiency and possibly even damage to the fuel system. The reason for this difference is that ethyl alcohol, another name for ethanol, contains about half the amount of energy when compared to regular gasoline. Gasohol 95, with its higher octane, would enable a car to perform slightly better than gasohol 91. In order to achieve comparable performance to regular gasoline when using gasohol, engines have to be modified to use a fuel pipe that has a section area twice as large and fuel injectors that are twice as fast. Most cars that were manufactured after 1995 can handle E10 gasohol, but newer cars are being made that can function using E20 gasohol, which is 20% ethanol and 80% gasoline.